Humidity is the proportion of water vapour in the ambient air. Humidity is a term we encounter in several different situations, as many everyday phenomena and our own health and wellbeing are directly influenced by it. Wet laundry dries and releases moisture in the air, glasses fog up when you come from a cold to a warm place. We also talk about what humidity levels should be in the living room and bedrooms that is pleasant enough, as well as ideal for our body, e.g. mucous membranes. We are also dealing with humidity when we talk about mould and mildew: higher humidity values promote mould and mildew growth, and this can have serious consequences to our health. Humidity also plays a significant role in the weather forecast, as its values provide information on the formation of fog, dew and clouds. When you read or hear about ideal indoor humidity, it is usually the relative humidity that is meant. Since warm air absorbs more water vapour than cold air, we must also take into consideration another moisture measure: the absolute humidity. What is the absolute humidity? If we want to know the total amount of water vapour that is actually present in the air, we look at the absolute humidity. This is expressed as g/m3, i.e. grams of moisture per cubic meter of air. The absolute humidity is an important factor for various physical calculations, such as for calculating the relative humidity; however it is less relevant to everyday life. When you read or hear about ideal indoor humidity, it is usually the relative humidity that is meant. The relative humidity describes how much of the air is saturated with water vapour. It is expressed as a percentage of the maximum amount of water vapour the air could possibly hold. What happens at 100% humidity? When the relative humidity rises to 100%, the air is completely saturated with water vapour and the air does not absorb any more water vapour at this point. As soon as the saturation point is exceeded, the excess water vapour precipitates, in the form of condensation or fog. The air temperature determines how much water vapour the air can absorb. Here, we come across another important element for the understanding of humidity: the dew point. Warm air absorbs more water vapour than cold air. When the ambient air cools down, while the absolute humidity (i.e. the total amount of water vapour in the air) remains unchanged, the relative humidity increases up to 100% as a result. If the air continues to cool, the excess water vapour condenses in the form of droplets of water. The dew point is the temperature at which this process begins. The relative humidity and temperature thus determine the dew point. Why is the dew point so important? Moisture settles on common cold spots found in buildings such as windows, corners of walls and inside roller shutter boxes. When the temperature reaches the dew point, water droplets form as a result. In addition, this can also contribute to mould/ mildew growth or foxing may appear on paper, such as books and pictures. How do I measure humidity? A hygrometer solves this problem for us. This device is based on the property that certain materials have, which is to react to changes in air humidity. In analogue humidity meters, this manifests itself in the form of expansion or contraction. 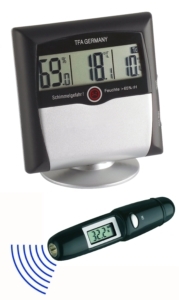 Digital hygrometers integrate components in which conductivity depends on the humidity of the ambient air. A hygrometer is a device used to determine the relative humidity. Conclusions can be drawn about the quality of the ambient air with the help of the values obtained. Is the air overly dry or too humid? Is there a risk of mould/ mildew in the living spaces? Does my room have the ideal humidity level? Is the humidity level ideal for storing books or musical instruments? We can answer all these questions based on the hygrometer readings and immediately recognise whether the humidity level is ideal or not. 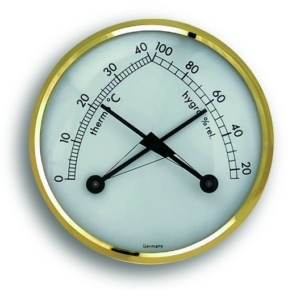 What types of hygrometer are available? Today, we have several options to choose from, when it comes to measuring the humidity in the ambient air. 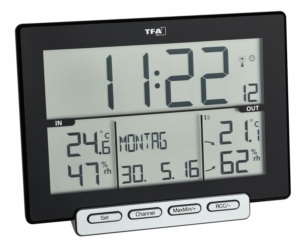 Depending on the purpose and preference, you can opt for an analogue or a digital hygrometer. When combined with a weather station or a WeatherHub Smart Home set, digital hygrometers can benefit from wireless technology which is also used to transmit the measured values from the transmitter to a base station or an app. 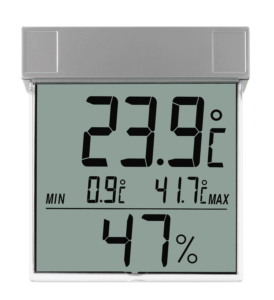 This way, you can read the hygrometer’s values in a very convenient way and with additional functions such as max-min readings and to set alarm for values. Analogue hygrometers are also called absorption hygrometers. The measurement is carried out with the help of water-attracting (hygroscopic) materials. The classic amongst analogue humidity meters is the hair-tension hygrometer, which utilises human hair as gauge. In modern hair-tension hygrometers, a synthetic hair is used instead. Who invented the hair hygrometer? The hygrometer was invented by the Swiss physicist Horace-Bénédict de Saussure in the 18th century. He took advantage of the properties of the human hair: when the humidity increases, the hair expands and contracts again as the air becomes drier. Blond hair in particular was considered ideal because it is very thin. 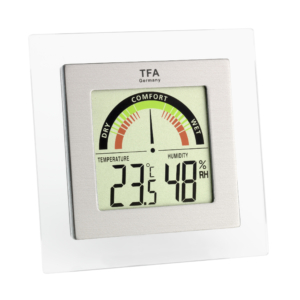 At the heart of the TFA-patented and particularly precise synthetic-hair hygrometer lies a synthetic hair. In bimetallic hygrometers, the hair is replaced with a coated bimetallic spring. How is an analogue hygrometer calibrated? TTFA hygrometers are calibrated at the factory. Transport, storage or even permanent use in a dry environment affects the hygroscopic functioning of the bimetallic spring or the synthetic hair. In order to keep your hygrometer in top shape, we recommend that you regenerate the measuring device at least every six months, calibrate and adjust it if necessary. Regeneration is primarily about restoring the ideal texture of delicate materials. Hair, for example, can become brittle if constantly exposed to dry air. By exposing the hair to a high-moisture content environment, you restore its natural state, hygroscopic properties and accuracy. Soak an ordinary tea towel with warm water and wring it out completely so that it does not drip. Wrap the device in the cloth completely for 15-30 minutes. When removing the cloth, the displayed humidity should ideally be in the range of 90 to 99% RH. Please note, however, that a damp cloth does not provide a clear reference value. If recalibration is required, the hygrometer should be calibrated by comparison against several other hygrometers or a precision reference device (e.g. psychrometer) after regeneration and under normal room conditions. The devices must be placed next to each other under identical conditions, ideally with a little air circulation. Give the devices 30-45 minutes to acclimatize. Stop the wait with a timer. In the back of the device there is a small slotted adjusting screw or a plastic screw visible through a small hole. With a thin slotted screwdriver, you can now carefully adjust the needle on the front of the device to the determined value. The instructions for regenerating and adjusting analogue hygrometers have been compiled for you as a printable PDF. So you can always keep your device in top shape with the help of our guide. 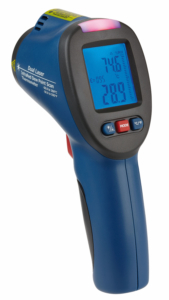 The closer the reference value is to the subsequent ambient conditions, the more accurate your measurements will be. In the case of dry rooms, choose a lower spot to adjust it and when using in a humid environment, choose a higher spot instead. 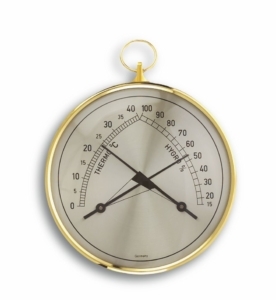 Calibrate or gauge a hygrometer? In order to determine the exact level of humidity in the air, particularly with analogue hygrometers, care must be taken. We recommend that you regularly regenerate your hygrometer and adjust it if necessary. This process is commonly known as calibration or gauge. The digital hygrometers from TFA are ready for use after the batteries have been inserted. They measure the current humidity at the installation site within a few minutes after sufficient acclimatization. Since the quality of the room air always depends on the temperature, we offer combi tools with which you can measure the humidity and temperature simultaneously. 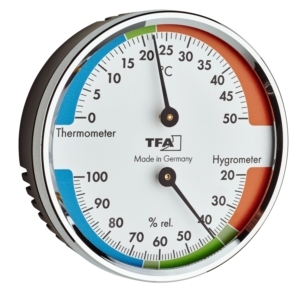 TFA’s digital thermo-hygrometers are available in numerous designs and for many special applications. What is the ideal location for a hygrometer? To determine the humidity perfectly, choose a central, well-ventilated place for the device, not directly next to a heat source or outside wall. The immediate proximity to windows and doors should also be avoided. If you want to mount your hygrometer to the wall, we recommend that you pay attention to the same conditions. If you have any questions about the best place to measure the humidity, our customer service will be happy to help.